Lending team: You can track loan growth year-over-year to ensure that loans are made at an appropriate credit spread when the loan is originated or renewed, and analyze the credit performance of the loans in portfolio over time. 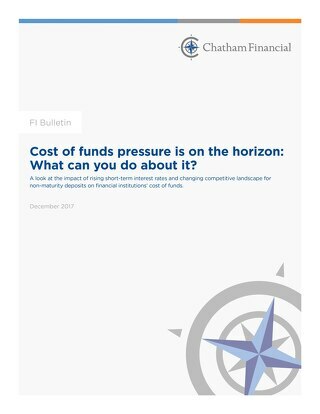 Deposit gathering team: Comparing the cost of funds for the branch to wholesale market rates and local peer FI cost of funds can help effectively measure this team’s performance. You can also ensure the deposit mix at the branch is not over-weighted or under-weighted to your targeted deposit mix. What is your duration and credit risk appetite? What is your interest rate risk (IRR) position? How does the security portfolio help to balance that IRR position? What is your interest rate view? Your investment manager is constantly performing a juggling act, trying to strike the right balance between earnings, liquidity and interest rate risk, all while considering the impact on capital when making decisions to buy and sell investment securities. 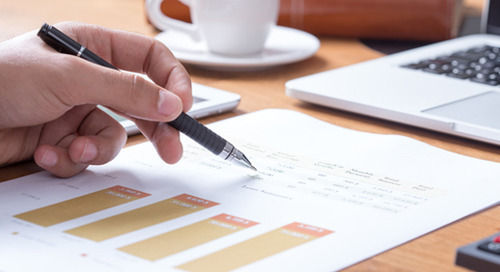 Rather than examining the investment portfolio in a vacuum, the approach described herein considers the entire balance sheet strategy and how the investment portfolio complements that strategy. Arrange for an independent review of the investment portfolio by a professional investment advisor on a periodic basis. The review will ensure securities that are purchased and sold are done so within Policy. The review will also assess the quality of the trade execution. Assess the relative performance of the investment portfolio compared to option-adjusted spread (OAS) and price sensitivity targets. Compare results to a benchmark portfolio. 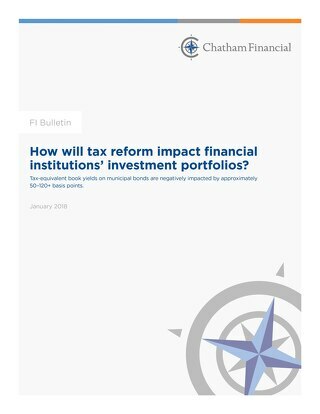 This should be based on the structural requirements of the FI’s portfolio split between a liquidity portfolio and an earnings portfolio, while factoring in the FI’s Policy guidelines and the Board’s risk tolerances. Benchmarking performance is a leading practice and requires a significant amount of time and expertise. Compare results to peer group results. This analysis usually leads to more questions than answers, as the peer groups’ Policy limits, risk tolerances, portfolio structural needs, interest rate risk position, liquidity risk position and interest rate view are all unknown. Accordingly, the results derived from a peer group analysis should be taken with a grain of salt. Generally, a much smaller team than the loan portfolio team oversees the investment portfolio. Introducing an independent investment advisor to the investment management process can quickly enhance it. 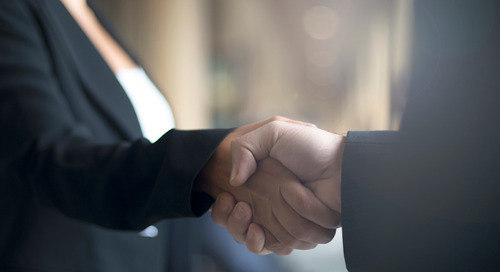 The independent investment advisor will ensure bond transactions comply with Policy and are in accordance with management and Board risk tolerances. An independent investment advisor has real-time knowledge of the market, and will be able to assess the quality of the investment decision as well as the quality of the transaction execution price. FIs that perform this independent review draw a comparison between the loan review performed for the loan portfolio and the independent review of the investment portfolio, and create an enhancement to the internal control testing function. Boards of Directors also draw comfort from the independent review. Frequency of an independent review depends on the portfolio activity and complexity of the bonds held in the portfolio. Typically, the independent investment advisor will perform the review on a quarterly basis, but can occur less often depending on portfolio activity. 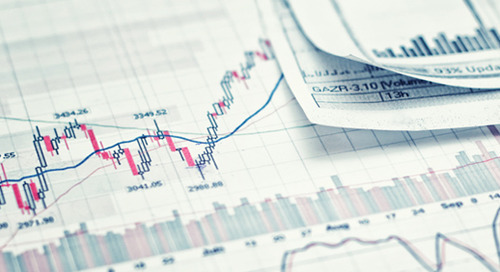 Bond analysis, similar to any other earning asset on the FI’s balance sheet, should focus on risk and return. Typically, FI investment managers assess risk and return by analyzing spread to US Treasuries and duration when comparing the relative value of bonds that are under consideration for purchase. 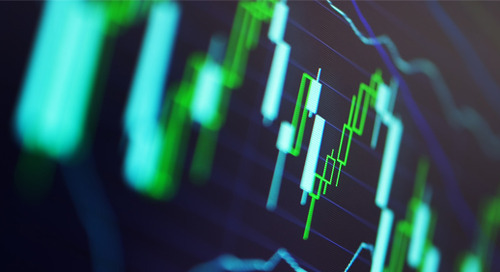 Although spread to US Treasuries (return) and duration (risk) appear on the surface to be acceptable measures for analyzing bonds, there are two better measures to use. In analyzing return, OAS is a measurement that has been popular for many years and well known to CFAs and professional investment managers. Option-adjusted spread is a well-named measure, as its name clearly describes what the measure means. OAS is the spread to a benchmark curve (usually US Treasuries or swaps) after considering the value of optionality embedded in the instrument. For non-option instruments, the spread to the benchmark curve and the OAS are the same. Take this recent real-world example: one bond with a one-time call option in one year with a 10-year final maturity, compared to a 10-year non-callable bond. Stop here for a second to contemplate which bond should yield better than the other. The only difference between the two bonds is the one-time call in one year. Accordingly, the value of the one-time call option should be the difference in price/yield between the two bonds. We should expect a higher yield for the one-time call bond, as we have sold the one-time option to the issuer. Considering the value of the one-time call option is critical to the analysis. This is where OAS comes into the picture. Typical analysis would focus on the first three rows, in which the one-time call bond “wins”. However, we expected to be paid more for selling the one-time call option to the issuer. Were we paid enough? The last row gives us the answer, and that answer is no. The OAS for the one-time call bond is lower than the no call bond. The investor in the one-time call bond yielded 5 bps less than they should have. When analyzing risk, duration is a good starting point. However, when considering the risk of instruments with optionality, convexity also needs to be considered. When dealing with instruments with embedded options, the cash flows change as interest rates change. Accordingly, duration alone cannot account for the expected bond value changes for interest rate changes, and that is where convexity steps in. For the purposes of measuring risk, we will focus on the modeled percentage value change for a +300 basis point parallel shift in the yield curve, rather than using duration and convexity math. Now that we have improved measures (OAS and price sensitivity), how should they be used in assessing the performance of the investment management team? The easiest method is to establish portfolio targets for OAS and price sensitivity in a +300 parallel shock. The targets should be based on the FI’s Policy and risk tolerances, as well as the structure of the investment portfolio, with separate targets for the liquidity portfolio versus the earnings portfolio. One more thing to consider: make sure that the model used to measure OAS and price sensitivity can consistently measure the statistics for all investment products in which the FI is permitted to invest. Comparing the investment portfolio to a benchmark portfolio is considered the best method to assess the performance of the investment management team. However, establishing the benchmark portfolio and tracking it over time is a real challenge for most FIs. Specified in advance: The benchmark is known to both the investment manager and the FI management team. In addition, the benchmark is specified at the start of an evaluation period. Appropriate: The benchmark is consistent with the manager’s investment approach and style, as well as the portfolio’s objectives and constraints. Measurable: Its value and return can be determined on a reasonably frequent basis. Unambiguous: Identities and weights of securities constituting the benchmark are clearly defined. Reflective of the manager’s current investment opinions: The manager has current knowledge and expertise of the securities within the benchmark. Accountable: The investment manager should accept the applicability of the benchmark and agree to accept differences in performance between the portfolio and benchmark as reflecting active management. Investable: It is possible to invest in the benchmark as an alternative to active management. For the first quarter of the analysis, determine the yield based on duration (and credit risk) for each security type in each benchmark portfolio. Model each security in an analytical tool in order to establish a base period value that will be used to calculate the quarterly returns over time. In one quarter’s time, calculate the total return of the actual portfolio compared to the total return of the benchmark portfolios. 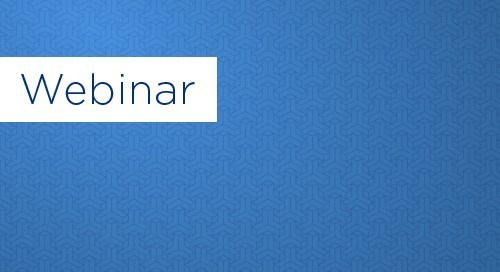 Perform a return attribution analysis (similar to a rate/volume analysis) and comment on the difference between the actual bond portfolio and the benchmark portfolio. Implementing a benchmarking process can be quite involved and time consuming. The cost to implement may outweigh the benefit. However, utilizing an independent investment advisor with the models required and the experience to implement the process, could serve to enhance the entire investment management process and could improve overall portfolio returns, as well as ROA and ROE for your FI. What is the duration and credit risk appetite of the investment portfolio of the peers? What is the overall interest rate risk position of the peers and how does the investment portfolio fit in their overall sensitivity position? What is the percentage of the investment portfolio that is held for liquidity purposes (i.e. pledging) versus for earnings invested as loan surrogates/long-term investments of the peer group? If your FI requires holding securities for liquidity purposes, this will ultimately limit your permissible investments compared to peers. This example shows the investment portfolio breakdown for two banks that are in the same peer group based on asset size and geography. Bank A would likely have a higher liquidity portfolio compared to Bank B, as Bank A has a low amount of securities to total assets, has a high loan-to-deposit ratio, and a lower tier 1 leverage ratio. 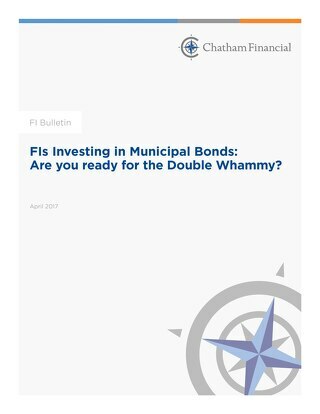 Note that Bank B has invested 14.5% in equity securities and 24.3% in municipal securities, where Bank A has only 4.4% in municipal bonds and a similar percentage in corporate bonds. At a minimum, you would expect Bank B’s investment portfolio and yield to exceed Bank A’s due to asset allocation alone. Would you suggest that Bank A’s management team should readjust its portfolio to look more like Bank B’s? Or vice versa? The short answer is maybe. There is not enough information to make that assessment. A peer group analysis usually generates more questions than answers as the peer groups’ Policy limits, risk tolerances, portfolio structural needs, interest rate risk position, liquidity risk position and interest rate view are all unknowns. Analyzing the performance of your investment management team requires consideration of a multitude of factors. Strategically partnering with an independent investment advisor can help ensure that your team is performing at the level that you expect. There are three methods to manage a bank’s investment portfolio: in-house, broker/dealer or outsourcing to an independent investment advisor. What is the true cost of each? Improving security portfolio yields can help to bolster total interest income earned, return on assets (ROA) and return on equity (ROE). 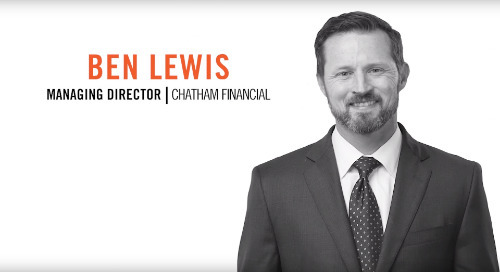 With the President signing off on the Tax Cuts and Jobs Act on December 22nd, 2017, financial institutions (FIs) must determine how the changes will affect their business as a whole. With a more volatile yield curve expected in the upcoming years and continued competition for loans, net interest margins (NIM) may continue to compress for many financial institutions (FIs). 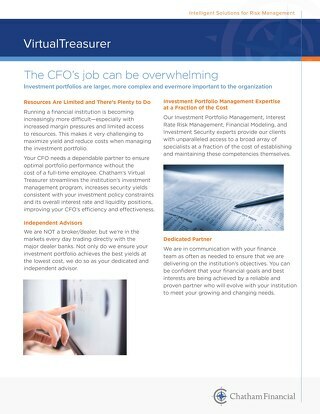 Your CFO needs a partner to ensure optimal portfolio performance without the cost of a full-time employee. 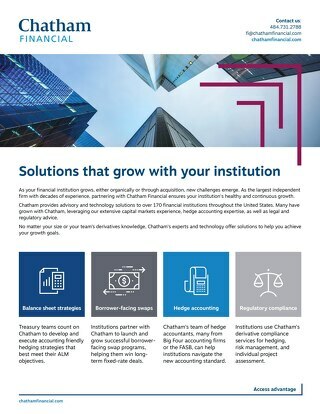 Chatham’s Virtual Treasurer streamlines the institution’s investment management program. 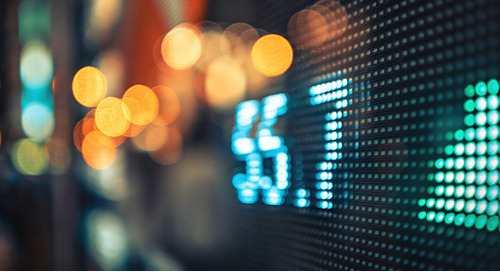 A look at the impact of rising short-term interest rates and changing competitive landscape for non-maturity deposits on financial institutions’ cost of funds. Expanding the search from the P&L expense line to the balance sheet reveals several “dollar bills” of profitability growth potential via net interest margin expansion. How Sticky Are Your Core Deposits? Changing market conditions are creating real concerns for financial institution management teams and present a battle that will put core deposit stickiness to the test. With a more volatile yield curve expected, and continued competition for loans, net interest margins (NIM) may continue to compress for many financial institutions.